Podcast: Will Utley be Chased off Second? 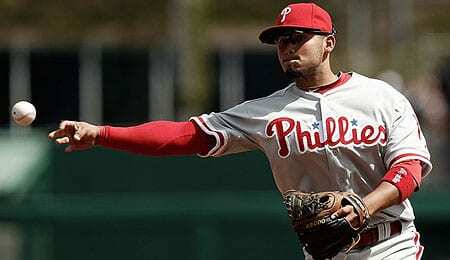 Could Freddy Galvis force Chase Utley to another position? Can the NHL get its act together or are we headed for yet another work stoppage? Could the Twins seriously be thinking of parting ways with Joe Mauer? The Orioles, who just keep hanging around, have signed Randy Wolf. Is there anything to see here from a Fantasy perspective? Casey Kelly’s superb debut and what we can expect from him over the long haul. Collin McHugh also looked damn fine in his first start. What does the future hold for him? Why are the Dodgers struggling after all their major acquisitions? Scott Diamond’s appeal for headhunting being dropped and what a pleasant surprise he’s been for the Twinkies this year. Tim’s crashing Flash ushering in yet another level of technophobia for him. Buck’s reminiscing about the history of Florida baseball and the lack thereof back in the day. The great Boston fire sale and what it means to the future of the Red Sox. Tim ‘quality controlling’ a batch of cookies meant for RotoRob, to the point that the batch suddenly ceased to exist. Rickie Weeks’ huge night which was only cold comfort to owners that have endured his dreadful season. As always, to hear the show in full, simply click the play button below. Do it. Do it now. This entry was posted on Friday, August 31st, 2012 at 12:54 pm	and is filed under BASEBALL, Buck Davidson, Podcast, RotoRob, RotoRob's Fantasy Baseball Weekly, Tim McLeod. You can follow any responses to this entry through the RSS 2.0 feed. Responses are currently closed, but you can trackback from your own site.